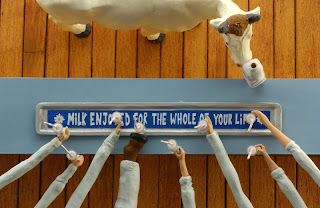 After the succes of the Cravendale commercials in 2006, Wieden & Kennedy and Nexus contacted directors Stéphane Aubier and Vincent Patar to make 3 new TV ads for Cravendale Milk. Sets and characters were build and animated in our Beast Animation studio's. Beast's Ben is 1st assistant director and Beast's Steven director of animation. Check out the new Cravendale website and watch the TV ads here!